What do I value about the other person? What do I value about myself? When do I “invest” in the other person? When do I invest in myself? Does the other person feel valued? Do I feel valued? What prevents me from valuing myself and others? What are the explicit relationships of authority between us? What are the implicit relationships of authority between us resulting from our life experiences (parenting, prior relationships, social mores, etc.)? How do these relationships of authority influence how we express our needs and hear the needs of others? In what ways do I feel wealthy? In what ways do I feel impoverished? When do I feel out of balance with each other people? How do I address that imbalance currently? How would I, in the future, like to address imbalance? Do I feel “in healthy movement” with the community? Do I feel “the illness of being stuck” with the community? Where am I, and what is needed? How do I get out of the way of myself? Body: What is the physical expression of my community? For example, meeting places, places where people live, the neighborhood, etc. Soul: What are the qualities of my community? For example, what are the members passionate about and how is this expressed in the “interests” of the community? What does community value and what does it disdain? We can replace the words “person”, “people”, “community” with other concepts: “partner”, “business”, “co-worker”, “boss”, “child”, and so forth. These questions are not limited to our relationship with a generosity community but are valuable whenever we are in relationship with something or someone else. Also, we have many relationships with people and entities (work place, church, charity, grocery store, etc) based on the context of our needs. What is still a question for me, when I look at the trends of generosity communities, Local Investment Opportunity Networks, income pooling, and crowdfunding, is that these all express the need to fill a void that people are experiencing. I am still unclear on what exactly that void is that isn’t being filled by our current social structures and how to clearly articulate that void in an objective and concise way. That will be the topic of further investigation and discussion. On July 4th, 2012, my neighbor, Travis Henry, attempted to commit an act of civil disobedience, which led me to study the definition of civil disobedience. Travis documents his actions here. Travis was arrested and charged with two misdemeanors: Entering a Closed Federal Area and Interfering with a Federal Officer. He was released the next day, fined $375 and required to attend a court appearance. On October 25th, 2012, Travis wrote a “Letter on the Nation’s Probation” to the U.S. Probation Office, which you can read here, in which he refused to pay the fine and attend the court (besides also stating his aim of replacing our current system of government with what Travis calls a “Threefold Republic.” On Nov 19th, 2012, ten U.S. marshals showed up next door to where I live to arrest him, apparently for failure to pay the fine. To further understand why Travis took those actions, you can read more about Travis’ Threefold Declaration here and download the declaration here. The discussion that follows is not concerned with Travis’ agenda, nor is it concerned with the response of the U.S. government in his arrest by ten U.S. marshals. What is of concern in this discussion is the understanding of civil disobedience, the confusion that can surround the topic, and why this confusion exists. The distinction between direct and indirect civil disobedience was brought about as a result of the 1991 court case United States v. Schoon.4 A direct act of civil disobedience is one in which the law being broken is the same law that the person is protesting against. Rosa Parks refused to give up her seat on a bus to a white passenger, protesting bus segregation. Thoreau refused to to pay the state poll tax – this was in direct response to the taxes being used to fund the war in Mexico and enforce the Fugitive Slave Law and constitutes an act if direct civil disobedience because a portion of the taxes funded the war and the slave laws. The definition of violence is itself difficult to reach. “If the significant criterion for a commonsense notion of a violent act is a likelihood of causing injury, however minor, then these kinds of acts count as acts of violence.”1 The salient point of this view is that any act, that causes injury is considered an act of violence, no matter how minor the act. Agreeing on a definition is one thing, but another thing is determining whether an action even falls in the “however minor” category. More on this later. One of the reasons for the range of characteristics of civil disobedience is the political context in which the action takes place: “it grants that the appropriate model of how civil disobedience works in a context such as apartheid South Africa may differ from the model that applies to a well-ordered, liberal, just democracy.”1 However, one thing is clear – as we continue to broaden the concept of civil disobedience, we start treading on other forms of protest “such as conscientious objection, forcible resistance, and revolutionary action.”1 As the concept of civil disobedience broadens, blurring the lines between these different types of protest, it begins to “weaken claims about the defensibility of civil disobedience and invite authorities and opponents of civil disobedience to lump all illegal protest under one umbrella”1, which might be considered an undesirable consequence. I encountered confusion resulting from my having a poor understanding of civil disobedience when considering whether Travis’ actions are civil disobedience. Ironically, I had a few weeks before his arrest read Thoreau’s essay on civil disobedience and also found myself questioning whether Thoreau’s views can even be applied in today’s entangled society, in which it is effectively impossible to isolate oneself from “supporting” the very systems with which one disagrees (the issue of taxes falls into this category.) This led me to do some research on the definition of civil disobedience, and I discovered the Stanford Encyclopedia of Philosophy and the essay on Civil Disobedience, which mirrored much of the polarity in my thinking and brought further clarity to those and other aspects of civil disobedience. Crossing the rope and signing his Declaration of Interdependence on the desk of John Hancock. Refusing to pay the fine and appear in court as a result of the his first actions, which violated various laws. Indirect Travis’ action is clearly indirect. He is breaking laws that have nothing to do with his convictions of injustice in the political, economic, and social spheres. Open and Public Covert Travis’ actions were covert to begin with – he did not notify the authorities of his intention before hand, but could be considered open afterwards because he has written about his action and the reason for it. Non-Violent While I could argue that, if a million people were to do what Travis did the desk would definitely suffer damage from use, this seems a bit far-fetched, and coupled with the ambiguity of the definition of violence, it seems to me that Travis’ act is inherently non-violent. Continued Disobedience Travis’ actions are clearly not in accordance with fidelity to the law – he did not communicate his intention before hand and he has also continued his disobedience by refusing to pay the fine after his action. Direct Here we might consider Travis’ actions more direct, as he is at least protesting the laws of the government, the change of which is one of his aims. Open and Public Writing his letter is clearly an open (and since it was posted on the Internet, public as well) expression of communicating his intention. Non-Violent I would find it difficult to argue that writing a letter is anything but non-violent. Continued Disobedience The reader may disagree, but this strikes me simply as continued disobedience – in the sense that Travis, in writing his letter, continues his disobedience. Travis is not accepting the legal consequences of his actions, using them instead to further his protest. At least, this is as much as I know of the situation as I am writing this. If anything, Travis’ arrest has brought me to a deeper understanding of the complexity of civil disobedience. His actions are literally all over the map when it comes to figuring out whether they fit into the narrower or broader conception of civil disobedience, and this can result in confusion. My aim here has not been to judge Travis’ actions nor the response of the U.S. government. Rather it is to understand where the confusion regarding civil disobedience comes from, both with regards to Travis’ actions and with the concepts of civil disobedience. Hopefully I have provided the reader with some understanding of the complexities surrounding the definition of civil disobedience and provided some food for further discussion. 1 – Stanford Encyclopedia of Philosophy and the essay on Civil Disobedience. 4 – How Civil Disobedience Has Affected Our Legal System in the U.S.
What follows is a paper that last year I commissioned Peter Buckbee to write, looking at social finance models from the perspective of Steiner’s threefold social model. Additional editorial contributions were made by Hillary Corsun. I’m finally getting around to posting his paper here. Enjoy! In its essence Social Finance, or Socially Responsible Investing, is about making investments that provide not just a financial benefit but also a social and environmental one. This is often referred to as looking out for the ‘Triple Bottom Line’ of People, Planet, and Profit. Investors can affect the Triple Bottom Line by choosing to invest in projects that are directly aligned with it, by choosing to screen out any investment from their portfolio that may be harming people or the planet, or by using their power as shareholders to advocate for social and environmental policies within a given corporation. The organizations that use these vehicles run the gamut from a loose network of investors and businesses to big banks with billions of dollars in assets. Any one organization may use a combination of practices. 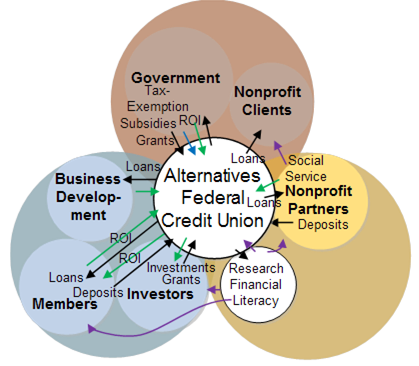 For example, Alternatives Federal Credit Union (AFCU) is a Community Development Investment Institution based in Ithaca, NY, that offers Microloans and Program Related Investments among other usual banking services. AFCU also receives Grants, Community Development Investment funds from the government, and Program Related Investments. Microfinance is the practice of providing small loans, credit, and other financial services to people who otherwise lack access to such services due to low income level, limited credit history, or remote location, for instance. Services are generally offered to promote entrepreneurship and economic independence with the belief that, if given access to capital, poor people can raise themselves out of poverty. Organizations such as Kiva achieve this through securing many small loans from people all around the world, and working with field partners and volunteers in poor regions to match investors with borrowers. Other microfinance organizations may focus more narrowly on a given sector or region. The Carrot Project, for instance, focuses on creating financing opportunities for small-scale, sustainable food production in the Northeast U.S.
Loan programs can exist as an independent entity or as a part of a larger financial institution. Socially Responsible Loan programs differ from conventional ones in that they are mission-aligned and serve the Triple Bottom Line in some way. While microfinance tends to emphasize small loans to low-income communities, Socially Responsible Loan programs may offer more conventionally-sized loans to a broader contingency within the parameters of Social Finance. Investment Clubs and Impact Investing Networks are a very direct flavor of Social Finance. The Securities and Exchange Commission (SEC) defines Investment Clubs as “a group of people who pool their money to make investments.” Investment clubs are not regulated and do not have to register as an Investment Corporation if ‘Interests’ (investments) in the club aren’t considered securities, or if they have an exemption such as “non-public offering” status. Interests aren’t considered securities as long as every member of the club plays an active role in decision-making. Clubs such as the No Small Potatoes Investment Club in Maine focus on Loans to small businesses, while others may choose to make equity investments or partake in some other form of investment. Investment clubs typically file as partnerships or LLC’s. Impact Investing Networks may be as simple as an email list of potential investors and businesses and a quarterly meeting, like the Washington State-based Local Investment Opportunities Network (LION), or may be a more structured nonprofit which partners with other foundations, family offices, and investors. Program Related Investment (PRI) is the practice of providing equity investments, loans, or loan guarantees at lower-than-market rates to mission-aligned projects with a charitable purpose. Given the expected return of principal, at minimum, and interest, in many cases, foundations may designate a portion of their assets or grant budget to PRI as a way to recycle capital to charitable projects. PRI allows foundations to provide such projects with larger amounts of capital than a typical grant size. The largest sectors funded by PRI include Education, Affordable Housing, Economic and Community Development, and the Environment (Source: Foundation Center, 2010, “Doing Good with Foundation Assets”). Community Development Investment (CDI) is a catch-all term within Social Finance for practices that focus especially on the “People” aspect of the Triple Bottom Line. Like Microfinance, CDI targets low-income communities and addresses such issues as affordable housing, job creation, education, and small business development. Common vehicles for CDI include Community Development Financial Institutions (CDFI), Community Development Credit Unions, Community Development Corporations, and Community Loan Funds. These are usually nonprofit organizations that offer financial services such as loans, bonds, and public and private equity, as well as education and consulting to the specific underserved communities they are embedded in. Funds are often matched by the Federal Government’s CDFI Fund. A Social Impact Bond (SIB) is a kind of contract between private investors, government, and nonprofits. Investors provide funding to nonprofits who in-turn provide preventative solutions to social problems like drug addiction and juvenile delinquency, which might otherwise escalate and place demands on federally-funded social programs and the justice system. If the agreed-upon outcome is achieved, as assessed by a third party, then the government reimburses investors with interest or performance bonuses. If the outcomes are not achieved, the investment becomes a donation to the nonprofit and the investors receive no financial return. In other words, when an SIB successfully meets its goal, government sees improved social outcomes at a reduced public expense, investors see a social and financial return, nonprofits obtain a revenue stream, citizens see safer, healthier communities, and the individuals served by the nonprofits receive help getting their lives on track. 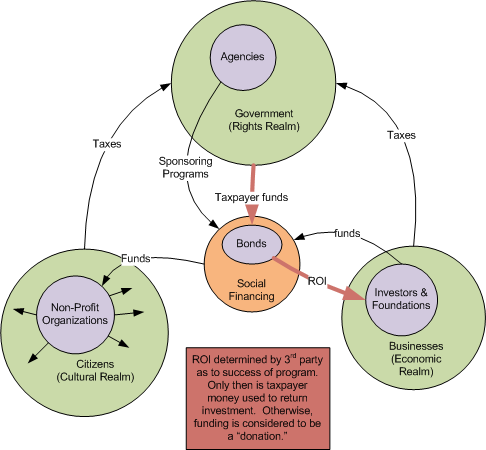 Many Social Finance organizations include Grantmaking (the offering of grants) in their repertoire. Grants are most often made to mission-aligned nonprofit organizations but may also be made to socially responsible businesses, educational institutions, or individuals. While Grantmaking does not see the direct financial returns that loan and equity investments do, Grantmaking does provide tax-deductions and sought-for social or environmental outcomes. Grantmaking can also help an institution or program become profitable in the long run. Grants have to be applied for and recipients usually must write a report upon completion of the funded project demonstrating they met the intended outcomes. Donor Advised Funds are an intermediary between direct philanthropic gifts or pledges and formal Grantmaking. Donors (families, individuals, or organizations) place funds into an institution with a Donor Advised Fund program and advise that institution as to how they want their money used. Organizations or individuals can then apply to the Donor Advised Fund to receive grants or donations. The Institution does the administrative work and provides the opportunity for a tax deduction. In turn, the institution has access to capital that can be invested for a return. While Donor Advised Funds allow donors to make recommendations as to what they want their money to be used for, institutions overseeing the funds have full control of the capital once donated and are not obligated to follow the recommendation. Crowdfunding is another way to make donations. As the name implies, it relies on many small donations from friends and supporters to help fund things like artistic projects, citizen journalism or disaster relief. Web platforms like Kickstarter and online social networking sites like Facebook are instrumental in this type of funding. 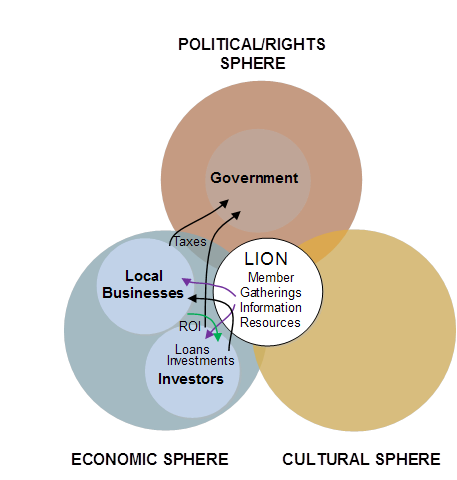 Narrative: The Local Investment Opportunities Network (LION) started in Port Townsend, Washington. There is no legal entity; it is simply a network of individual investors interested in investing in locally operated and locally owned businesses looking for funding. There is, however, an application process to become a member in which the applicant outlines his/her profile and the opportunities he/she is looking for and completes a confidentiality agreement. Members have access to an email list of interested parties as well as community social events and quarterly meetings. LION provides some standard investment agreement templates but does not offer legal or financial advice. Investors and borrowers can choose to involve their own lawyers or financial advisors. Interest rates and other terms of investment are set for each investment opportunity between parties involved. It is standard for borrowers to provide investors with a business plan. Money Flow: Investors make loans or purchase equity shares in local businesses and get aid back on the terms they set with the borrower. Narrative: Kickstarter is a New York City-based online fundraising platform to support creative projects in the fields of film, music, journalism, technology, food, etc. 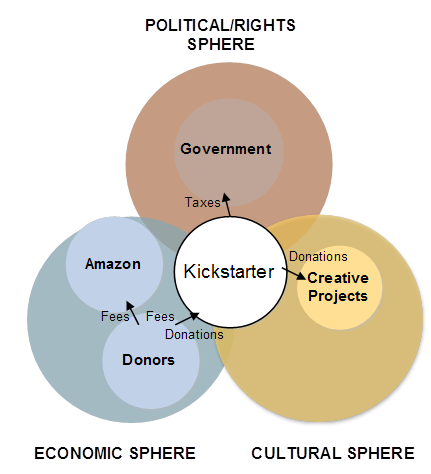 Projects funded through Kickstarter rely on Crowdfunding, which takes the form of small donations from friends and supporters. Donors receive a ‘reward’ in return for their donation, which generally comes out of the project itself. For instance, a reward could be a copy of the music cd or comic book created, or a ticket to a dance performance. Projects have to have clearly defined goals and expectations and a creative purpose. Charities cannot apply. Individuals and organizations can post their project on the Kickstarter website to solicit donations. The amount of money needed to complete the project and the timeframe for completion must be specified. If the project doesn’t achieve its fundraising goal it doesn’t receive any funding. There is no fee for posting a project. Kickstarter only charges a fee if the project successfully reaches its fundraising goals. Money Flow: Individuals make donations online towards creative projects. If the project successfully raises the amount of money specified within the timeframe specified by the project creator, the donor’s credit card will be deducted, Kickstarter will charged a 5% fee, and Amazon will charge an additional 3-5% credit card processing fee. 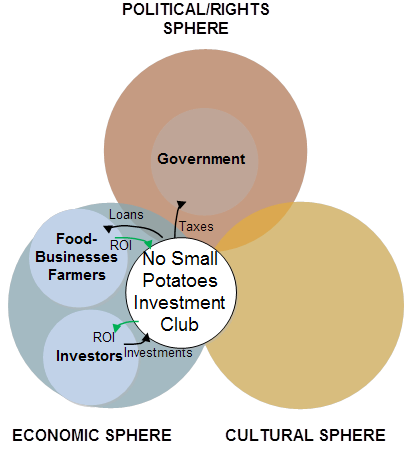 Narrative: No Small Potatoes Investment Club incorporated in Maine in the spring of 2011. The club makes low-interest loans to Maine-based food businesses and farms. There are two basic requirements to join the club: A minimum initial investment of $5000 and active participation in investment decisions upon joining. One does not have to be a certified investor to join the club. Active participation from all members makes it so the club does not have to register its investments with the Securities and Exchange Commission. Money Flow: Investors buy into the club. The pooled investments are used to make low-interest loans to Maine-based food businesses and farmers. Farmers pay back loans with interest. Narrative: Kiva is a non-profit organization out of San Francisco, California. Kiva’s goal is to help alleviate poverty. On its website, the organization highlights lending opportunities to underserved individuals all around the world. The average loan size for the recipient is about $400. Loans are given for agriculture, housing, and small business development. Loans are sometimes pooled to make them more substantial and also distributed as a ‘pool’ to be divided amongst a group of people. There is no return for the lender. Loan recipients are charged interest to cover the costs of the loan. 100% percent of the lender’s money goes to the borrower. Kiva partners with independent, pre-existing microfinance institutions called ‘field partners’ which are firmly established in the borrower’s community. Field partners help to match lenders with a best-fit loan opportunity. Kiva is funded by grants, donations and corporate sponsorship. 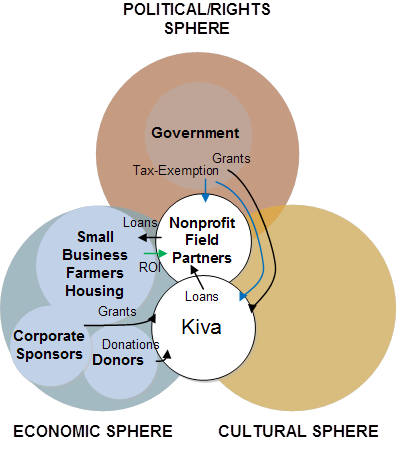 Money Flow: Lenders make a no-interest loan to Kiva from anywhere in the world; kiva gives a no-interest loan to a field partner in the community of the specified borrower; field partners provide a loan with interest (to cover their costs) to an individual borrower or group of borrowers; borrowers repay field partners; field partners repay kiva; kiva repays lenders. Kiva covers its own costs from public and private grants, donations and corporate sponsorship. Narrative: Create Jobs for USA is a brand new program initiated by Starbucks’ Chief Executive, Howard Shultz. Create Jobs for USA is a partnership between Starbucks and Opportunity Finance Network (OFN). Starbucks will pay for marketing and operating costs of the program, as well as make a $5 million donation for seed funding. Once the program is up and running, it will depend on small donations from Starbucks customers and individual online donations. Donations become equity for Community Development Financial Institutions, which can leverage the equity 7:1 and make loans to underserved communities in the U.S.. Donors receive a patriotic bracelet in exchange. Money Flow: Individuals make a donation either at Starbucks or online. The donation goes to a fund at Opportunity Finance Network (OFN), which is a network of CDFI’s. Donations become equity for CDFI’s, which can be leveraged 7:1. Government matches investments from CDFI Fund. CDFI’s make loans to underserved communities for small business development, job creation, housing, or banking services. Borrowers pay back the CDFI. Narrative: The Carrot Project, based in Somerville, Massachusetts, partners with other nonprofits and Community Development Financial Institutions to create regional financing programs as well as business and technical support for small and mid-sized farmers and food-related businesses, to collaborate on innovative agricultural research, and to provide investment opportunities in sustainable agriculture. They offer four loan programs in Maine, Massachusetts and Vermont geared towards providing farmers and food-related businesses with start-up capital, working capital or funding for capital improvements. Loans vary in size from $3,000 to $75,000, typically have a 7% interest rate, and 1 to 7 year terms. collateral to a partner organization. 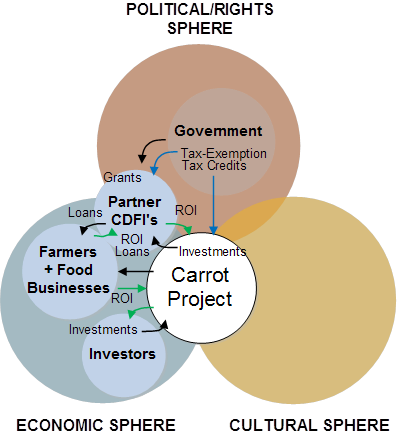 Partner organizations may match Carrot Project investments with CDFI or private funds, or leverage them to make loans. to farmers and food businesses, who, in-turn, pay back the partner organization, who then pays back the Carrot Project. 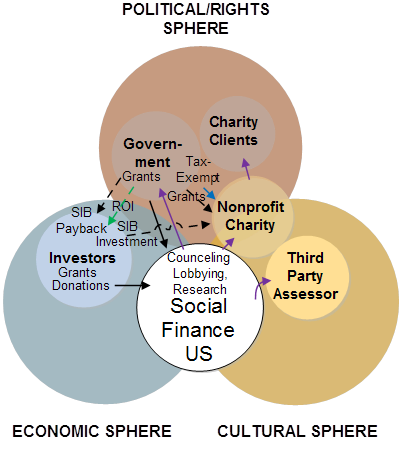 Narrative: Nonprofit organizations like Social Finance US, based in Boston, MA, are ‘blazing the trail’ in the U.S. for Social Impact Bonds (more common in England), and consequently have taken on a comprehensive strategy to advocate for SIB’s. SIB’s must first be legislated by the state or federal government so Social Finance US lobbies government. They also find investors to provide initial capital, identify and council nonprofits that can provide the social service, structure terms of the SIB, provide management and oversight of the SIB for the nonprofit, and hire third-parties to assess outcomes. Money Flow: Investors place funds in a Social Impact Bond, administered by Social Finance US. Funding goes to a nonprofit that, in-turn provides a preventative social service. If the nonprofit successfully achieves expected outcomes, the Government compensates investors with interest or performance bonuses. 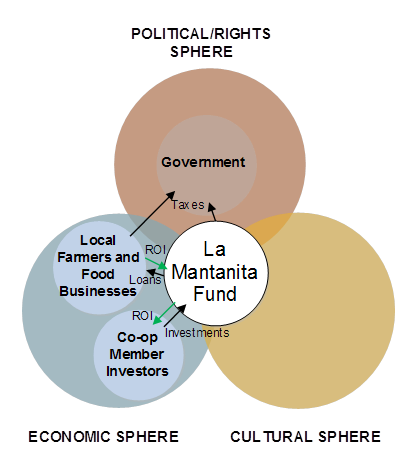 Narrative: La Mantanita Fund (LaM FUND) is a program of La Mantanita Co-op, a food co-op based in Albuquerque, New Mexico. The fund was created to provide “pre-payment” for product loans to farmers and food producers who sell their products at the co-op. In the last year the Fund expanded by selling “interests” (shares). Interests were set at $250 each. 400 units were issued in total – 100 A-Interests and 300 B-Interests. The Co-op bought all 100 A-interests in order to cover any outstanding balances in the event of loan default. This way the coop also showed their support for the program and lessened the risk for other investors. B-interests were made available on a “first come first serve” basis to co-op members living in the state of New Mexico. In order to keep the grassroots nature of the Fund, a peak on investment was set at $10,000 per individual. Any Income generated by the Fund is divided in proportion to number of shares. Payment on investments is approved by a vote of the Co-op Board of Directors, in a similar manner as annual membership patronage refunds get approved. Interests have a one year term. Narrative: Alternatives Federal Credit Union, out of Ithaca, New York, is a Community Development Credit Union (CDCU). CDCU’s are set up to serve low-income and minority communities with imperfect, limited, or no credit background. Like conventional Credit Unions, they are nonprofit, tax-exempt, government regulated and insured, and cooperatively-owned and governed. CDCU’s provide loans, savings, affordable banking, and products and services to help members free themselves from high-cost, predatory debt. They also offer financial education and counseling to their members and community. Community Development Credit Unions are a particular kind of Community Development Financial Institution (CDFI). CDFI’s serve a variety of needs, including job creation, business and commercial real estate development, affordable housing, and basic financial services to underserved communities. An organization meeting such a need can apply for CDFI certification from the U.S. Department of Treasury’s CDFI Fund. The fund provides CDFI’s with monetary awards (at least a 1:1 match on private investments) and tax credits. 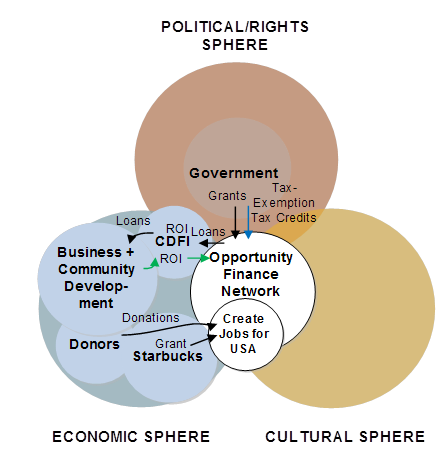 As a private-sector organization, each CDFI takes a unique approach to the issues. Alternatives has a number of innovative financial and educational services. For example, they have a Community Partnership Lending program for clients of partner nonprofits where the nonprofits raise funds and deposit them at Alternatives, then Alternatives will lend double that amount to the clients of that nonprofit. Minimum Investment: Minimum one-time $20 membership fee plus $5 deposit. Risk: Depositors risk is low as Alternatives is NCUA insured. The Credit Union’s risk varies depending on the financial product they are offering. Microloans are generally considered high-risk to the investor, though in reality high payback rates are common. Government Bonds are low risk. Collateral: Alternatives offers several different kinds of loans and loan guarantees, each with unique collateral demands. In all cases the borrower is responsible for providing collateral. Money Flow: Funds come from member equity and deposits, non-member deposits, private and government grants and investments, and government bonds and subsidies. Funds go directly to small business development, mortgage and personal loans, and educational efforts. Narrative: RSF Social Finance (RSF) is a pioneer Social Finance organization dedicated to transforming the way the world works with money. Their target areas are sustainable agriculture, education and the arts, and the environment. RSF offers a range of financial products and services, from $500 seed fund donations to 5 million dollar loans and capital lines of credit. The organization stands out among Social Finance organizations for their integration of Investing, lending, and giving within a single nonprofit. RSF Social Finance also hosts and sponsors educational events and initiates various forms of dialogue around money and transparency. Minimum Investment: Minimum donation for Donor Advised Fund is $5,000. Minimum gift awarded by RSF Seed Fund is $500. Loans offered by RSF range from $200,000 to $5 million. Risk: Investors take on risk. Loan repayment history is 100% so risk is low. Money Flow: There are various and complex money flow circuits around RSF. 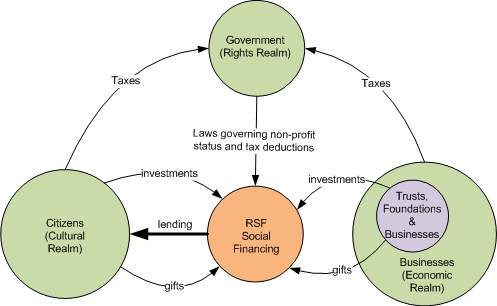 Basically though, investors place financial resources with RSF and RSF administers them, providing loans, gifts and other forms of investment to for-profit and nonprofit enterprises. This threefold articulation of society has its origins with the Austrian-born philosopher and educator Rudolf Steiner (b. 1861 – d. 1925), but is increasingly referenced in contemporary innovative social thought. For instance, David Korten, Founder of YES! Magazine, recently wrote about rebuilding the economy by starting new economic initiatives, redefining our cultural narratives, and changing the rules (or laws) around how we do economics (Source: D. Korten, YES Magazine Blog, 2011). According to Steiner’s original articulation, the Economic Sphere has everything to do with how we meet one another’s needs in society – through the cycle of production, distribution and consumption. The Political/Rights Sphere has everything to do with how we live together in a peaceful and equitable way within society – through the laws, agreements and political structures we create. And the Cultural Sphere has everything to do with how we nurture and develop human capacities – both mental and physical – as individuals and within society (Source: R. Steiner, The Social Future, 1919). So, education, science, art, and religion are all examples of cultural phenomena because they develop and nurture human capacities. Governance – as far as it involves the making of laws that protect human rights, democracy, and civility are examples of political/rights phenomena because they all have to do with making society more peaceful and equitable. And finance, manufacturing, trade, and consumption are all economic phenomena because they have to do with meeting human needs. 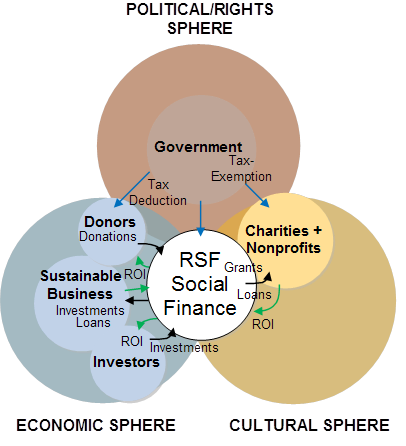 This document references the three spheres (Economic, Political/Rights, Cultural) in relationship to which sphere of society funds originate in and which sphere they are destined for through the flow of Social Finance Capital. Funds, or Capital, or Money, are always circulating between the spheres, making it difficult to say exactly where funds originated. For instance, the government may offer funding to a Community Development Financial Institution (CDFI) or a Social Impact Bond (SIB) but that money first came from taxpayers who earned their money within the Economic Sphere working at their job. This document provides a snapshot of an isolated phenomenon. The true origin and ongoing circulation of money is more complex and involves all three spheres: It has to become ‘Fiat’ (made into legal tender) within our political system; it must have a corresponding value which is created, in part, through human intelligence and capacities of refining labor (developed within the Cultural Sphere) refining labor and, in part, through labor working on ‘land’ or on a ‘nature product’ to create a commodity within the Economic Sphere. For this snapshot view of Social Finance examples, any funds that were not allocated by the government are considered to have their origin in the Economic Sphere. Bank deposits, private investments, and personal donations all come from the economic sphere because they were earned at some point, directly or indirectly through production, distribution (or trade), and consumption. Only two of the Social Finance practices mentioned in this document rely on government funding: Social Impact Bonds and Community Development Investment. Funds going to support education, art, science, research, social work, and assessment are considered to be destined for the Cultural Sphere. This is the case with Kickstarter, RSF Social Finance, Alternatives Federal Credit Union, and Social Finance US. Assessment, as in the example of Social Finance US, is included in the Cultural Sphere because it relies on the capacity of judgment and concerns itself with human development – i.e. whether or not the clients of the nonprofit in question have progressed inwardly and outwardly through the service provided. Social work, or charity, is hard to place. On the one hand it belongs in the Political/Rights Sphere because it raises human beings up to a more equitable and dignified place in society and helps them secure their rights. On the other hand it belongs in the Cultural Sphere because it relies on the ‘healing arts’ of the care providers, which help to nurture and educate their clients. In recognition of this dichotomy, the administration of the service has been placed in the Cultural Sphere and the receiving of the service in the Political/Rights Sphere. Funds going directly to government through Treasury Bonds or taxes, for example, as well as funds going to support the clients of nonprofit charities are considered destined for the Political/Rights Sphere. This is the case with Alternatives Credit Union, LION, No Small Potatoes Investment Club, and Kickstarter. It is not always so straightforward. Social issues are complex; and in our current social system the three spheres are often entangled in unhealthy ways. Take homelessness, for example. Is this a political/rights issue, a cultural issue, or an economic issue? In some ways, it involves all three spheres. It is an economic issue in that it has to do with whether or not a person can afford a place to live; it is a political/rights issue in that it has to do with how we organize our society in a more or less equitable way; and it is a cultural issue in that it has to do with the person’s biography, the social or cultural environment he/she comes from, and whether or not we, as members of society, through our self development, feel inclined to care for our fellow human beings. Most big issues have roots in all three spheres, but one can usually tell where the primary root is. Issues like homelessness, poverty, and joblessness, for instance, appear to have their primary root in political/rights life. The main function of this sphere is to maintain fairness and equity. That there are some people in society that cannot get a job, do not have enough money to live, or lack a home appeals to our sense of fairness and human dignity. In a healthy society, these issues are addressed in the political system and made the concern of each and every citizen. Once they are recognized in the political/rights life, then it becomes the responsibility of economic and cultural life to align itself accordingly and administer the appropriate services. Looking deeper into social life, it becomes apparent that there is a threefoldness within each of the three spheres of society. There is a culture to economics and politics, economics to culture and politics, and politics, governance, legal, or rights concerns in economics and cultural life. Colloquially, we speak of ‘consumer culture’ or ‘business culture’ when referring to certain behavior and practices within the economy. The culture of a car manufacturing company might be blue collar, rough around the edges, and direct, while the culture of an IT company might be progressive, entrepreneurial, and quick to shift. And in politics, the way campaigns are run, how candidates present themselves, and how rhetoric is used in debate is all reflective of a certain political culture. Looking at economics in politics and culture, one could note how schools, churches, political campaigns and government programs are financed. And finally, looking at politics, governance, legal, or rights concerns in economics and culture one notes how institutions are governed, how consumer and employee rights are acknowledged, and what laws are upheld in different cultures. This just begins to give a sketch of how the three spheres intersect with one another and co-exist within a single sphere. Together the three spheres make a whole. 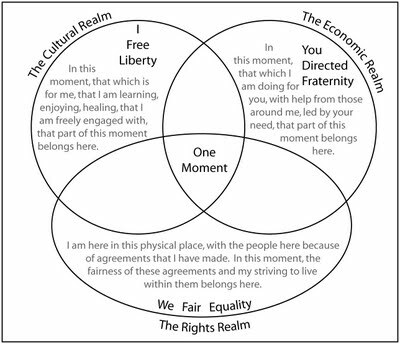 In any society, organization, or group founded by human individuals, regardless of whether the primary function is cultural, economic, or political, all three spheres find expression. The expression will, of course, look different in quality and magnitude depending on the main purpose of that group or organization. The examples cited in this document embody how an organization can work through primarily economic means to affect not only the economy but also culture and political/rights life. By choosing to include ‘people’ and the ‘planet’ in addition to financial profit in their value sets, such companies change the culture of the Economic Sphere – the way we think about doing business; and, they change the standard of living and the health of the planet, thus affecting the Political/Rights Sphere. In the drawings, this accounts for placement of organizations on the overlapping lines between spheres. Each of the three spheres finds its truest expression, however, when it is on its own, autonomous from the others; however, that is not to say that the three should not come together in organizations or groups. There is both healthy and unhealthy overlap. An economic organization without culture or rights obligations would be soulless and inhumane. When business interests control politics and education it is democracy and human development that suffer. Yet, knowledge and skill developed through education in the cultural sphere can only find useful application in the spheres of economy and politics. In a healthy society, each of the three spheres come to expression autonomously and in relationship to the others, and each sphere finds ample and balanced expression within the whole of society. Peter Buckbee lives in Philmont, NY, with his wife Kristin and eight-month-old daughter Isabel. He is a co-founder of Think OutWord, a peer-led educational platform focused on the study and implementation of new cultural, political and economic ideas based on the social philosophy of Rudolf Steiner. He has taught economics at the Hawthorne Valley Waldorf High School and has been involved in various entrepreneurial undertakings. Having undertaken this research project, he is now very interested in finding ways to get community capital to community initiatives. Hilary Corsun, Director of Marketing and Communication at Hawthorne Valley Association in central Columbia County, NY, enjoys brainstorming new business ventures and envisioning a generative and just new economy. She graduated from Cornell University in 2006 with a dual-major in Applied Economics & Management and Animal Science. She has served as Purchasing Manager in her family’s manufacturing business, worked at a microfinance fund in Senegal, and operated her own small enterprise for ten years beginning at age thirteen. The system provides an analyzer server, an application program interface, a user interface and an action processor. So, how did HTC get sued over this implementation? You don’t need an analyzer “server”, or an “API”, or an “action processor” to do this stuff. WTF? Yes, those are nice abstractions, but that’s all they are, not some “invention”. U.S. Patent Law . a new, useful process, machine, improvement, etc., that did not exist previously and that is recognized as the product of some unique intuition or genius, as distinguished from ordinary mechanical skill or craftsmanship. Apple. You FAIL. Patent Office. You FAIL. These patents are not a display of some unique intuition or genius. They are very ordinary, obvious, solutions to improving the user experience. This is why I don’t by Apple stuff. I refuse to feed the monster. Of course, that just means I’m feeding a different monster. Spread Networks has been building one such fibre-optic connection, shaving three microseconds off the 825-mile (1327km) trading journey between Chicago and New York. Meanwhile, a transatlantic fibre optic link between Nova Scotia in Canada and Somerset in the UK is being built primarily to serve the needs of algorithmic traders and will send shares from London to New York and back in 60 milliseconds. “We are running through the United States with dynamite and rock saws so an algorithm can close the deal three microseconds faster, all for a communications system that no humans will ever see,” said Mr Slavin. The experience of community in this last year is one of organic form which honors the freedom of each individual and their intentions in life. Each of us has our own unique path that we are following, and yet there is also commonality that becomes this vague, nebulous thing called “community.” It’s not so much vague and nebulous as it is organic, flowing, as each of us moves in, around, and through the lives of the others. There doesn’t seem to be a defined intention. Intention sometimes carries a projection of the desires for the future. Certainly there are individual intentions, but the best way to describe the intention of the community, as a whole, is to say that we strive to be present for each other. Certainly that is my experience of it! If there were to be an intention, not as a projection of some desired future, but rather the intention to be collectively supportive, I would say (and this is based entirely on a very recent conversation, so who knows how my thinking on this will change later), I would say that support really does come down to the economic realm. The reality that I’m experiencing is that there are people who need to be supported by a community because what they offer is not valued by the society. Here I want to make a distinction between “community” and “society”, the former being a microcosm existing in the latter. A simple example of this is teachers, teachers of the arts, to be specific. It seems that the collective body of work on the education of children has agreed that the arts—music, painting, drama, dance, singing, etc., is a vital part of a child’s physical, mental, and emotional health. But what programs get cut first when there’s a state budget crisis? The arts! How do we measure the aptitude of our children when applying to college? By the SAT’s, which measure math, vocabulary, and reading skills. Where are the arts? How do we measure school performance in the various iterations of the No Child Left Behind acts? Through the measurement of academic (as in sciences) success. Again, where are the arts? And there are people who teach us these things, but they are not valued. So one of the first things I see a need for community to address is to value each member of the community. And this means to create a model, and here I am reminded of Steiner’s threefold economic model, but in the microcosm of a community, a model in which some people are in direct interface with the aspects that society overvalues, and those people are supportive of those in the community whom our current society undervalues. The result, ideally, is that the community, as a microcosm, is balanced in its valuation. At the moment, I see this as the first conscious intention that a community should have. The second intention is that such a community should, by its own example, foster and nurture the revaluing of our entire societal structure. We certainly can’t make dramatic, all encompassing changes, but we can take small steps that eventually expand beyond the confines of the singular, solitary, community. Now, all this presumes that the community wants to move into this direction. That’s an important point, because it isn’t actually necessary. Underlying my two intentions above is, of course, a mutual agreement that this is a common desire and intention.